The internet is a breeding ground for all kinds of social activities because it expands the possibilities of communication. In order to keep web applications social and enjoyable, it is important for them to have one or more interfaces for the users to interact through. One such interface is the comment section. The comment section is where users can discuss a subject (post, video, picture) that they have access to. In the past, for a user to see a comment from another user, the user would have to refresh the browser window. However, with realtime comments now we can automatically pull in comments live. This article will cover how we can build realtime commenting using Pusher. Go (version >= 0.10.x) installed on your computer. Heres how you can install Go. SQLite (v3.x) installed on your machine. Installation guide. Now that we have our application, let’s move on to the next step. Let’s start by navigating into the src directory located in the $GOPATH. Then we’ll create a new directory for our app there. Create a comments.go file in this directory. ⚠️ If you use Windows and you encounter the error ‘cc.exe: sorry, unimplemented: 64-bit mode not compiled in ‘, then you need a Windows gcc port, such as https://sourceforge.net/projects/mingw-w64/. Also see this GitHub issue. In the main function, we have defined some basic route handler functions, these functions basically return hard-coded text to the browser on request. The last line will start Go’s standard HTTP server using Echo’s start method and listen for requests port 9000. 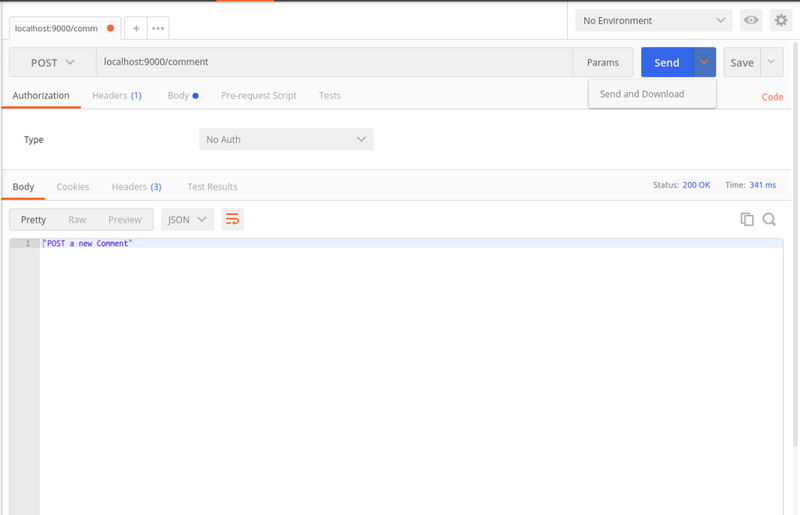 We can test that the application works at this stage by running it and making some requests using Postman. We will create a function that will initialize a database and for that, we need the SQL and SQLite3 drivers. We already added them to the import statement so uncomment them. We will also create a function that will migrate the database using a database schema defined inside the function. ⚠️ If you were already running the Go application you would need to kill the process using ctrl+c on your keyboard and then restart it to see changes. When the application is run for the first time, a storage.db file will be created in the working directory if it did not previously exist. We have tested that our application listens on the specified port 9000 and handles the HTTP requests as we configured it to. However, the current handler functions simply return hard-coded text to the browser so let’s create new handler functions to handle responses to the routes. The GetComments function fetches and returns comments from the database while the PushComment saves comments to the database and returns a response. ID – the ID of the comment. Name – the username of the user who made the comment. Email – the email of the user who made the comment. In Go, we can add metadata to variables by putting them within backticks. We can use this to define what each field should look like when converted to JSON. This will also help the c.Bind function know how to map JSON data when registering a new comment. sql := "SELECT * FROM comments"
The GetComments function is responsible for retrieving all the available comments from the database and returning them as an instance of the CommentCollection that we defined. sql := "INSERT INTO comments(name, email, comment) VALUES(?, ?, ?)" The PushComments function adds a new comment to the database. Next, create a public folder in our application’s root directory and create an index.html file inside it. We instantiate a comments array that will hold all the available comments. In the created() method, we use Axios to pull in all the comments available from the API and store it in the comments array. 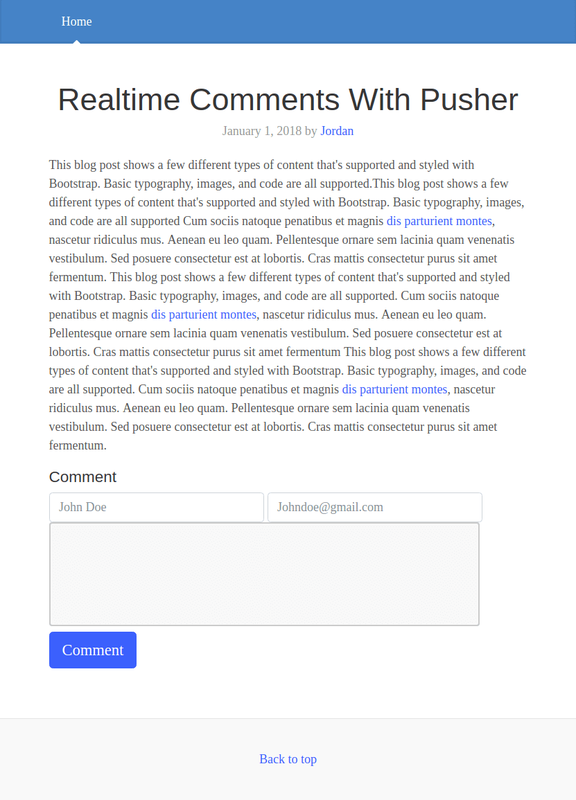 In the sendComment method, we send a request to the API to create a new comment. The next thing we need to do is make sure the comments are displayed in realtime. To do this, we need to trigger an event every time a new comment is added. We will do this in the backend using the Pusher Go library. ⚠️ Replace PUSHER_APP_* keys with your Pusher app credentials. In this newer version of the function, we create a newComment object that holds information for the last comment that was saved to the database. Whenever a new comment is created, we will send it to the Pusher channel comment-channel to be triggered on the event new-comment. In the code above, we are creating a Pusher instance and then subscribing to a channel. In that channel, we are listening for the new-comment event. In this article, we looked at how to build a realtime comment system using Go, Vue.js, and Pusher Channels. The source code to the application is available on GitHub. This post first appeared on the Pusher blog. Build a realtime comment app with Go and Pusher Channels was originally published in Hacker Noon on Medium, where people are continuing the conversation by highlighting and responding to this story.